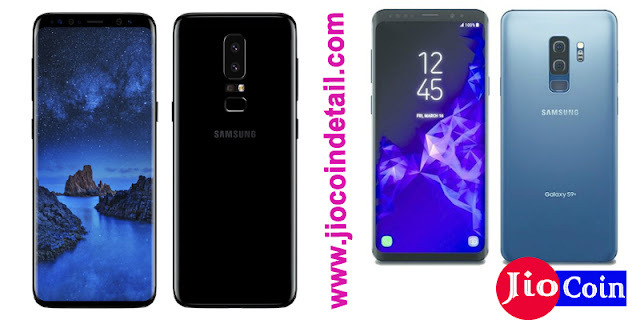 Jio Coin Tech had told you a few hours ago that the Samsung Galaxy S9 and Galaxy S 9+ will be launch in India on March 6 at a media event. Jio Tech can now reveal the Indian price of Samsung's new flagship smartphone. According to sources in the retail market, 64 GB models of the Samsung Galaxy S9 will be available in Indian market for Rs. 57,900. At the same time, the price of the initial models of the Galaxy S9+ will be Rs 64,900. The price of the Samsung Galaxy S9 and the Galaxy S 9+ of 256 GB variants will be Rs 65,900 and Rs 72,900 respectively. Jio Tech has come to know that 128 GB Variants introduced in Barcelona on Sunday were not offer in the Indian market. Both phones in the Galaxy S9 family are equipped with a 10 nm 64-bit octa-core chipset. There will be three variants based on storage - 64, 128 and 256 GB. All three variants will support up to 400 GB microSD card. Out of Android 8 Orio experience. The connectivity feature includes Gigabit LTE, dual-band Wi-Fi 802.11 AC, USB-Type C, Bluetooth 5.0 and 3.5mm headphone jack. Both phones have 8-megapixel front camera with F / 1.7 archer. Samsung Galaxy S9 has a 5.9-inch Quad HD + Curved Super Amoled 18.5: 9 display, 4GB RAM, 3000 mAh battery. The super speed dual pixel in the phone is a 12-megapixel autofocus sensor that is equippe with optical image stabilization. Its thickness is 8.5 millimeters and weighing 163 grams. At the same time, the Samsung Galaxy S 9+ has a 6.2-inch quad HD + + curved super amoled 18.5: 9 display, 6 GB RAM and 3500 mAh battery. The phone has a dual rear camera setup of 12 megapixels. The thickness of this phone is 8.5 millimeters and weighing 189 grams.